This is a low carb breakfast that I could eat day after day. It makes a super easy, busy-morning breakfast because the vegetables are easy to chop, prep and store and the sausage may be cooked in advance, in larger batches, for multiple omelettes--so there is absolutely no excuse for me to not spend 5-10 minutes making a warm breakfast every day. Even on our busiest mornings! 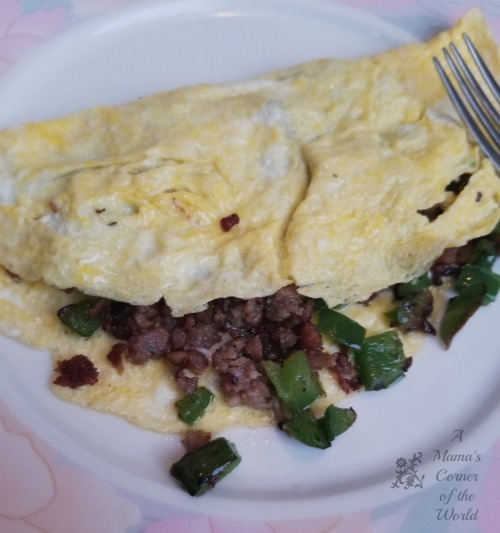 What is my recipe for an easy, low carb, Italian Sausage & Pepper Omelette? While we were not compensated for this post--we may receive slight compensation from affiliate links within our posts. However, we only link to products we personally use and recommend in our recipes and posts. Saute the Vegetables. Melt the coconut oil over medium heat until hot. Add the vegetables and saute over medium heat until tender--usually about 3-5 minutes. Add the Italian sausage and spices and cook for 1-2 minutes more. Remove the sauteed vegetables and meat from the pan and set aside. Prepare the Omelette. Wipe out the pan and add the remaining teaspoon of coconut oil to the pan. Allow it to melt over low-medium heat. Pour in the whisked eggs. Spread the eggs evenly across the bottom of the pan. Allow the eggs to firm up a bit--then move the egg from the sides of the pan gently toward the middle--letting the liquid move toward the edges to firm up. 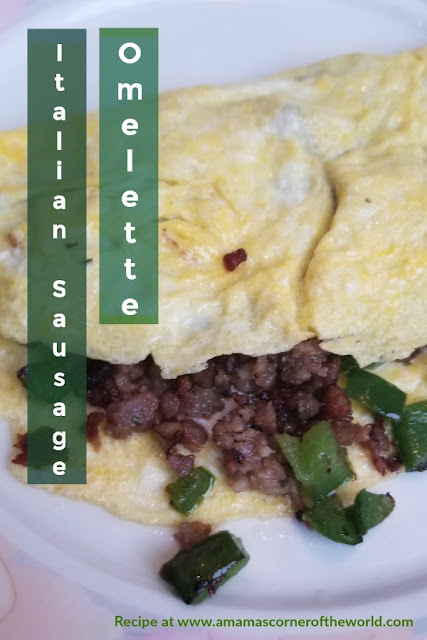 Allow the omelette base to mostly set through. Add the filling and close the omelette. Spread the sauteed vegetable filling down one half of the omelette base. Tilt the pan gently to one side--and use a thin, sturdy spatula to fold over 1/3 of the omelette base over the cheese and vegetable filling. Serve with a little salt and pepper, if desired.